Remember that the housing conditions you create for chipmunks are ideal for a number of different animals, insects and reptiles. Check your chipmunk houses regularly for uninvited guests. Although some consider them a nuisance, chipmunks are clever creatures that can be fascinating to watch. While chipmunks naturally live in complex underground burrows, you can encourage them to take up residence in a birdhouse-style nest by providing an enticing and species-appropriate shelter. Building a chipmunk house is an appropriate project for an amateur woodworker and a great way to introduce young children to the inhabitants of their own backyard. Locate an area where chipmunks are likely to nest. Find a shady and sheltered place near bushes or shrubs and away from general foot traffic. Because chipmunks collect and store food for winter, they prefer to nest in proximity to food sources such as nut- or berry-bearing trees. Provide the chipmunks with places to hide and rest by placing tree branches around the area. Use branches they can chew, such as apple tree branches, and be sure the branches have not been treated with pesticide. Modify several bird houses for use for your chipmunks. Select houses that are made from untreated wood, as chipmunks may chew the structure, particularly around the opening. The opening should be close to the base of the house and should have a diameter of 50-65 millimeters. If the houses are equipped with perches, remove them. Chipmunks are extremely picky in selecting a nest site, so providing a number of different housing options will increase your odds of success. Place the chipmunk houses throughout the area. 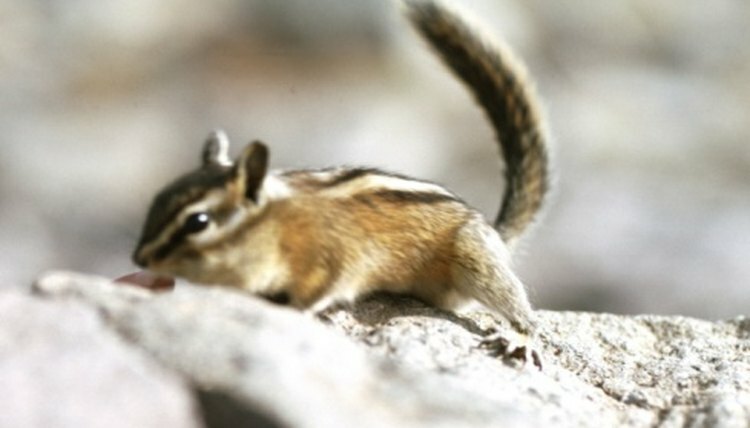 Make sure the houses are well-seated and level, as chipmunks will not inhabit a house that is not properly leveled. Where possible, locate the houses in heavily shaded corners with overhead coverage from a bush or a shrub. Pile rocks around the sides and back of the house to make the location more secure. Distribute appropriate nesting materials throughout the area. Chipmunks are very selective when gathering materials for their nests, so provide a wide selection of grasses and mosses. Sisal grass, peat moss, timothy hay, oat hay and dandelion grass are favorites for many chipmunks. Distribute a small amount of food around the houses to encourage chipmunks to explore the area. Peanuts, raisins or a handful of birdseed would work well.